For more information, visit the ARCH Network. It happened exactly 1 year, to the day I first contacted Jani Pirkola former project manager of the Realxtend team. I heard rumors late in 2007 that they had goals to accelerate the development of the ‘opensim‘ platform, and one of their priorities was 3D model imports. The conversation continued until a few weeks ago, when I received an e-mail from Jules Vos, founder of Visibuild, a company he founded aimed at leveraging and improving the capabilities of Realxtend, specifically targeting his efforts at architecture and the built environment. Before long I had the model populated with tables, chairs, sofa, stove, a Jenn-Air appliances, Kohler fixtures and more – all imported from Google’s 3D Warehouse, most of which are exact or near-perfect matches to the ones specified. Google’s 3d warehouse is very extensive, and carries one of the largest collection of free 3d models available. Thanks to Peter Quirk for the Sketchup import tutorial! I left parts of the design out of the imported mesh that we were still designing, and was able to enjoy the best of both worlds by building those pieces with primitive objects using the in-world building tools. This way, I could make immediate use of the model as a collaboration tool with our clients by testing, for example, ceiling options in the living room, and trying out an alternate arrangement of the porch and entry area. There is no limitation to the size of primitive objects here (the limit is 10 meters in Second Life), so it becomes much easier to model without always having to bandage the model to work around size limitations. The client’s first reaction after seeing a teaser was “I want more!” so I think we can safely say the value of a virtual model was immediately evident. Even a quick proof-of-concept study of imported buildings that surrounded a project site in Manhattan was fruitful. When almost any model format can be imported, it feels like the whole world has opened up – and the possibilities are truly without limit. The combined 3-part effect of being able to import contextual structures shared by others and import professionally built CAD or BIM-derived models and model bits and pieces using the familiar in-world building tools is a pretty astonishing new opportunity. Of course there are still kinks to be ironed out, and some parts of the work-flow that would benefit from further optimization, but that’s where Visibuild’s value becomes most apparent. They have the capability of streamlining that process for you, and serving as a one-stop service and hosting environment for architects, urban planners, realtors, city governments and anyone else with a vested interest interest in architecture and the built environment. Another key feature of this environment is the dynamic shade and shadows. You need a decent graphics card to experience it, but its nice to know that the feature is available when you’re ready for it. 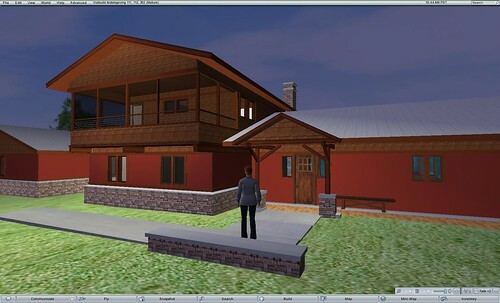 One common complaint for architects exploring the use of Second Life in professional practice was the plasticness of the builds, and the inability to convey the way light and shadow will effect the architecture. The code for dynamic shadows has been available for some time now, but has yet to be implemented in any of the newest viewer releases. This is surely a key fundamental to an architect’s concern in design development, and experiencing a building without light and shade doesn’t as accurately reflect the experience you will get in real life. Since most modern architectural software automatically generates 3D models anyway, the gap between your model and a virtual environment is no longer treacherous or time consuming – but relatively simple (or cost effective if you’d rather have someone else import it for you). If you already model in SketchUp, for example – you’re only a few clicks away from enjoying the benefits of experiencing the model virtually and inviting others to experience it with you in realtime. The bottom line is, most architects utilize 3D models at some point in the design development process anyway. With Visibuild, you’re just one ‘save as’ away from leveraging the value of that model, and enjoying all of the many benefits a virtual environment affords. Its accessible – there is very little mystery around how this works, and it isn’t terribly complicated or expensive. It is built on an open source platform, and with a little experimentation you can roll up your sleeves and tinker with it. You still have the option of hiring others to get everything set up for you. The choice is yours. User-generated content. I can’t modify the imported mesh in-world, but I can leave off parts of the build that aren’t finalized and use the simple in-world building tools to test ideas on the fly. Multi-user. I can create an account for each of my clients and project stakeholders (builders, subs, etc.) We can all occupy the building at the same time, from our own computers, wherever we happen to be in the world. I can also customize their accounts ahead of time – so their avatars look good, and they appear right at the front door. Realtime. Unlike an prescriptive illustration or animation, you get to choose how, when and where your avatar moves. This is much closer to the way people actually experience architecture. Collaborative. Multiple users can work together on a single group of objects to explore ideas – this capability is at the heart of what Studio Wikitecture is exploring. The incorporation of avatars. I think this provides an enhanced sense of immersion and a feeling of actually being in the space. This is truly a defining moment in the story of virtual worlds and architecture! IMHO Keystone is really not understating the significance of this. Most professionals I have talked to cite the inability to import CAD data as a non-starter. Its time to get started. I am looking for builders for I require a virtual classroom to install on a web hosted system. Great post…… This has been on my radar as the #1 requirement for my work since starting with SL 18 months ago. As Chip says this cannot be underestimated. I will be surprised if the brightest or even the dumbest in Linden Labs do not recognize the expansive nature of being able to provide their platform as well to professionals & manufacturers, from Urban Planners to Engineers to Architects. This is an incredible and inspirational blog post! Thanks – I think that this is one of the better explanations I have seen of the possibilities that Revit and 3D modeling hold. BTW, not sure if you have used it or not, but Arcat (http://www.arcat.com) has a free online library of true generic & proprietary BIM objects for use in Revit (About 500 objects). 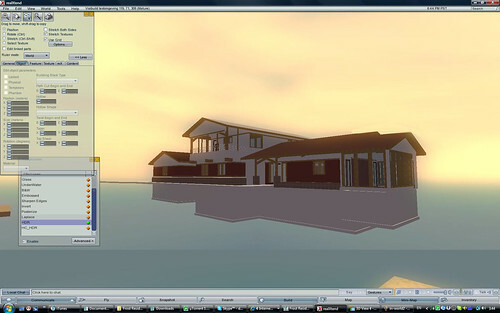 Thanks again for this amazing post – I will be sure to show it to clients asking about Revit and 3D modeling! 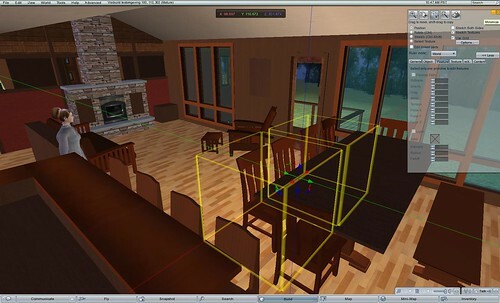 @MetaverseOne It would be great if you could point us to a video demo of that free CAD/BIM import into the multi-user browser-based world so we can compare the quality and features of each environment. I tried to find one to use in a recent post, but couldn’t. Must have been looking in the wrong places. I realize there are lot of similarities, like the fact that they’re both open, and free. But some things are different, like the lack of realtime in-world modeling tools that make multi-user design collaboration so effective in virtual worlds like opensim. So, its not really apples to apples yet. If you’re willing, maybe we could host a discussion/meeting in an X3D location of your choosing, to show off the architectural CAD/BIM import feature, so we can see it in action? If you ping me with some instructions I can share with the group, along with a day/time that works and we’ll go from there! We are taking 3d models from Revit and even Google SketchUp and creating 3d prints using our ZCorp 3d printer. It is really amazing technology. Very interesting post indeed. Based on your experience Keystones I am interested in what VisiBuild3D can do with AutoCad Revit. I visted their web site and see they dont have much to show or say at this point. Lets talk about this application if you have time – shoot me an email. i like to know more, me just learning Revit and like to know how to import model into SL.